Grady celebrates his first June with MeMe and PaPa at the Virginia Beach Boardwalk, 2014. There’s a good reason Anne’s sunny personality has won the hearts of so many readers for over 100 years now. And who can disagree with her about June? I’m guessing that even in the southern hemisphere it’s an agreeable time, more temperate than the months that follow. We can only wonder with Anne what a perpetual June might be like. I suppose the closest we’ve come to it was during the years we lived in Hawaii, but even there, we learned to recognize that there were seasonal changes to enjoy. For Anne (and for us here in Virginia) June is definitely worth celebrating– and you still have a couple of days more to do it. I hope you can take a few minutes today to savor whatever the climate might be bringing your way. Whether your June is bringing you carpets of green grass, sunshine, flowers, wind, rain, or something else I haven’t mentioned, I hope today is the charming kind of day that you’d not tire of for a long time. Hi MeMe, this will be short. My surgery went well but didn’t take away all the double vision. Everything else is okay and I will see the doctor on the 16th. I don’t know what it will be then. May take so adjustment on the left eye. I love Grady’s picture, enjoy him as much as you can, they grow up so fast. I will keep in touch. Love to all. I’m a Mimi. Hope all will enjoy the last two June days. Alan, that sounds blissful. I hope Jeff and I are able to visit Connecticut someday. Obviously, summer would be a good time to go, but I’ll bet autumn is beautiful too! Later this evening I plan to go out and enjoy a June walk at dusk. Hope you will have a nice week ahead. Fall here “is” beautiful. The weather is pleasant, and the foliage color is awesomely memorable. There is no better place to experience Autumn, than in New England. It prepares and strengthens its residents for the winter to come. I’m so fortunate now to be living in an area that I once longed to visit at that season of the year. Thanks Alan, the walk was lovely. Jeff and I will have to plan another fall trip to New England. We went there one late September but it was a strange year weather-wise and we missed the peak foliage times. So maybe when we go to Connecticut we’ll plan it for fall. ah.. life in ecuador is a bit like a perpetual may or june, depending on which area of either country you’re experiencing! still online a tiny amount of time, but am traveling today and using fast wifi! yippee! Z, I am so happy you were able to grab some fast wifi! I suppose you are about as close to the equator in Ecuador as a person can get, so that truly would be like a perpetual June. Jeff and I have never been to South America, but our daughter-in-law has been at least a couple of times, and I think she really liked it. SO, it’s probably a great trade off for having sporadic wifi service. If only Anne could have tried it – we might have a book in the series called “Anne of Ibarra.” 😀 Thanks for checking in during your very limited time online! The best part of my morning so far, “hello sweet Grady”!! I recognized his outfit from another photo you shared, teehee…my cute little Gnome in training. I can’t believe I missed your birthday, how did I manage that? Hope it was happy. Your flowers are already gorgeous, I can’t believe you got all that done PLUS working through a move. Your new home is already so lovely. I simply must learn to do container gardening right. Thanks for your kind words about Grady and the photo. 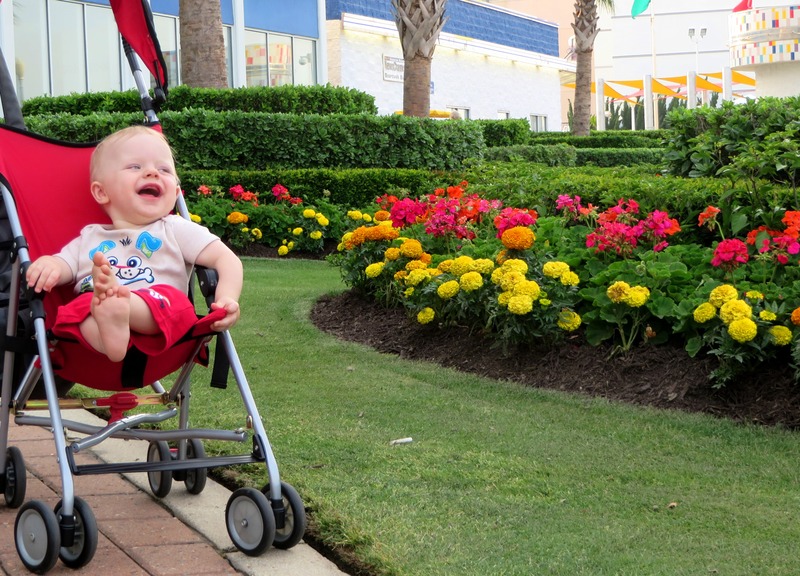 The Virginia Beach Boardwalk flowers are really nice and the area is quite well kept. Plus lots of interesting statues scattered all along the Boardwalk and the famous (at least on this blog) Belvedere Coffee Shop with the fabulous ocean views. When you and Alys come, we will have to try to make time to get down there if you can possibly stay long enough. Of course it would be wonderful to go to the Blue Ridge Mountains too and see Laurie. So much to do, so little time! I haven’t been to PEI either but Eric sent me some tea from there – a special blend named for Anne. I half cheated on the planters, buying hanging planters that were already grown in and full. Shopping Mid June has it’s benefits. I’m enjoying them because it’s so peaceful here and we love to sit outside. WOW – I need to add a book to the series – “Anne of Boomdeeville.” 😀 You will need at least 8 or 9 days to scratch the surface here but if we plan compulsively and leave lots of cushion time for playing by ear you should be able to have a great intro on which to base your second visit 😀 😀 😀 and probably Laurie can meet us at some interesting midpoint but if not, the trip to western Virginia is a lovely one! You will have to enjoy Victoria vicariously for me (double v words, how often does that happen?) and take lots of vivid, vivacious and valuable photos! Especially at Butchart Gardens! BTW I was toying with the idea of going out and buying full grown plants to hang everywhere and you have inspired me to do just that. If I manage to get to the garden store I will email you photos of the results. Don’t hold your breath though, hee-hee. Now what’s more romantic than ensuring beautiful flowers to gaze at in your garden? You can count on us to be camera crazy at Butchart Gardens. We can be vivacious with some effort 😀 Ohhhhh, you were talking about photo’s, that too (snicker). It’s going to be an amazing 12 months, I must have built up lots of lucky points. Decorating a new house, having a holiday with Alys in Victoria and traveling to spend time with two of my most favourite southern bells….dang, just pinch me! If you ever figure out how to get there, let us know – maybe we can meet you there! Pauline, I’m so glad your June has been relatively warm. If only I could box up some of our heat (sans the humidity, of course) and ship it your way! Let’s stay healthy so we will live long enough to beam ourselves around the globe when technology catches up to Star Trek. Then we can have spring morning teas in New Zealand or Australia, Summer morning brunches in California or Alberta, and gorgeous fall evenings with spiced apple cider here in Virginia. Just dreaming of course, but til then, the next best thing is hearing about your lovely weather. Hope you have a great week! Hugs to Siddie and Orlando. Sheila, I hope the rain stays away next weekend so you can have a glorious Fourth. Tell Weatherman Bill not to wax the cars since that ALWAYS brings on a rainstorm around here whenever Jeff does it. Also make sure not to spend too much time on your hair – that always brings on rainstorms for me. 😀 We had a nice week this past week – it was a bit hot but as in Camelot, it only rained after sundown. Perfect! You’ll have to come up sometime so we can stroll the Boardwalk together and have tea at the Belvedere. Have a great week! I love June, but dislike the Japanese beetles that munch on our roses and Canna lilies in June. 🙂 remember how wonderful it was to wake up on a June morning and realize that there were THREE whole months of freedom? What a beautiful, happy baby! Thank you, Rene! “Happy” is the word we hear most frequently used to describe him, and I am so thankful for that! Great shot of Grady. Looks like a cool garden. Last year June was so cold and rainy in Seattle that it gained the moniker-“Junuary.” This June ;however, is one for the record books, with several weeks averaging in the 70’s. They have decided on a name for baby girl number two- Josephine -A.K. Josie. Seems like some of the older baby names are coming back, but no Josephines in my family though I have know a few folks from church. Is it a southern name? Although I don’t think of Florida as a southern state-,of course it is and there was a section for Florida when I visited the Confederate cemetery in Marietta. Did I tell you we found a Confederate memorial- section of a cemetery- here in Seattle at Lakeview cemetery, where my wife’s family has a plot. ? Very interesting. If the 70’s are a record high for June, that sounds quite refreshing to me. I love the name Josephine and especially Josie (mainly because of the Steely Dan song) but I’m not aware of it being a southern name. I think it’s just the feminine version of Joseph so I would imagine it would be more connected to Catholic regions, which the south definitely is not, for the most part. Although to be fair, I can’t think of anyone at all I’ve ever known with that name, so I think it’s a good choice. I think you did mention the Confederate section in Seattle, which is definitely interesting. When we toured Fort Point in San Francisco, I was surprised to learn that the fort was on guard during the Civil War against a Confederate attack by sea that was planned but called off when the war ended. So I guess the Northwest was not totally isolated from Confederate sympathizers and even soldiers. What an inviting smile! Grady sends out the message: “Joy is right here!” It fills us up to see his lovely face! Thanks, Grandma! Thanks Mary Ann, and speaking of joy, you are going to be featured in an upcoming post about happy people. (Jeff’s suggestion when I asked him whose would be the best photo to feature.) 😀 You will recognize the three others in the photo with you! Stay tuned! Have to look up that Steely Dan song. Turns out Josephine is actually Hebrew in origin and means may “Yawheh” increase- feminine version of Joseph. Also the movie -“Outlaw Josie Wales.” -as I recall. Looks like Virginia Beach might be a nice little place to retire also. Michael, as with so many Steely Dan songs, the words are less than inspirational, but the beat is beyond compare. Virginia Beach is a nice town but I’m not sure I’d want to retire there. I don’t know why but it just doesn’t have that colonial charm of which I am so fond that runs strongly through the peninsula. Maybe it’s because the naval influence is so very strong, with Norfolk adjacent. In any case it’s nice to be within an easy drive. But for retirement we prefer Yorktown or the Williamsburg area. That’s just us, I guess. You’all have Fuchsia baskets out there? Ours are finally coming into bloom. Quite spectacular and my favorite is” Lena”-with double white and lavender blooms. The hummingbirds are back and they play tag in the yard between the Fuchsia baskets. I know they don’t tolerate the warmer climes that well and there were none in Hawaii. But in Hawaii we had orchids on our little Lanai outside our apartment overlooking Kaneohe Bay. What a ‘choice to make; Orchids or Fuchsias. I can’t decide although my wife does not want to live that far from the kids. Michael, I had gorgeous in-ground fuchsia plants while we lived on the central coast of CA, but have not tried to grow them here. We have enormous bleeding heart plants that remind me of them a little bit, with their hanging flowers (though the blooms are much smaller). I don’t recall seeing many fuchsias here and I imagine the heat would get to them. I agree with your wife; Hawaii is a wonderful place to live for a limited time, but it’s too far away from the mainland for me to want to live there again.